Thanks Janice for posting the pics! I love that show! @Bill...my pleasure. I love hunting down these scenes. @Paul...Rebecca (1940) is also a nice find. Here's the scene you described. 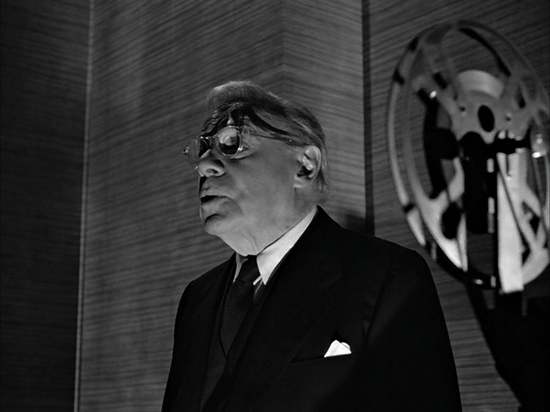 Does anyone know anything about the device used by the Wilfred Hyde White character in 'The cat and the canary' (1978) to show him reading out his will, twenty years after his death? 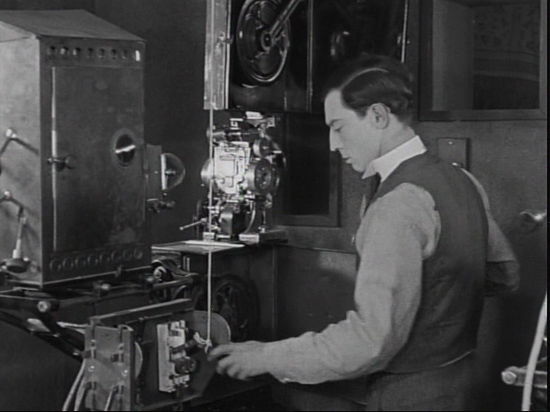 I think the makers of this film used some artistic licence as the projector runs through the potential inheritors entire supper, even though it appears to be simply a projector coupled to a cylinder player. It does, however, look similar to some old attempts at home 'talkie' machines I have seen pictures of in the past. Allan...I really liked this quirky movie... 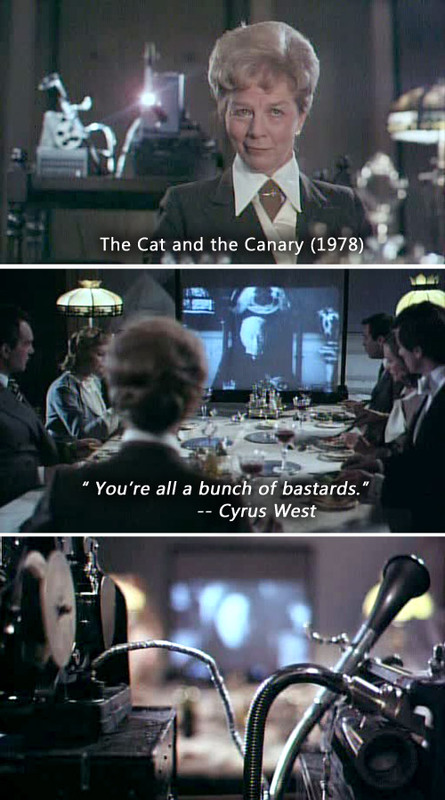 The Cat and the Canary (1978)...especially Wilfrid Hyde White who plays Cyrus West. His monologue in the will-reading scene is priceless. 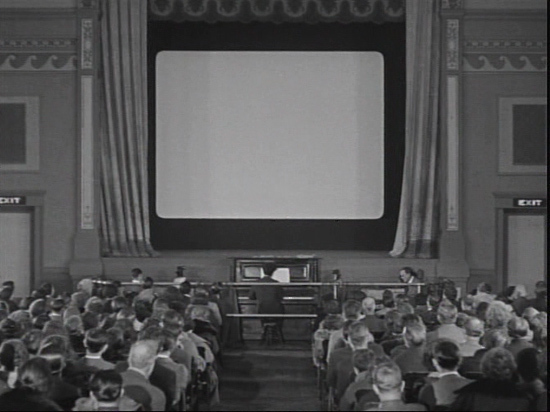 I think the director just took creative license with the length of the projection...there's not enough film to run as long as the scene did. 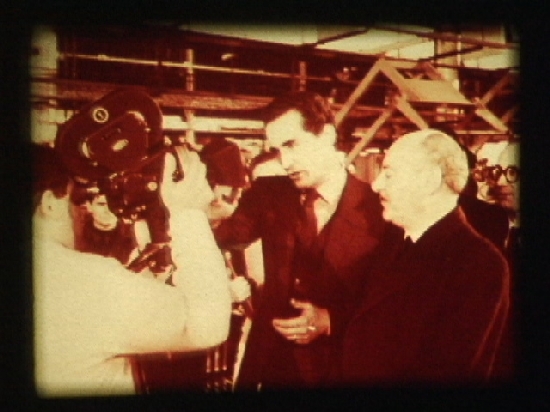 This film must hold the record for the longest a projector is seen in one film and also most of the film is about the film. Think I got that right? Allan. I think the projector is a Kodascope and these had a 400ft max spool capacity. 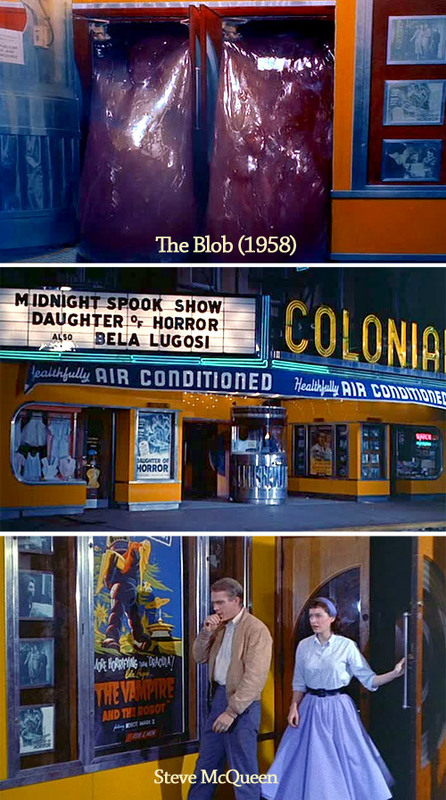 In The Blob (1958) there's no projector shown...but we can't forget the "oozing goo" in this theatre scene. At the beginning of The Tiger and the Pussycat (1967) a very funny Italian style comedy, we have the great Vittorio Gassman, a business man (and film producer) who is seen in his own film and later a screening room before he is lured into a tryst with Ann-Margret. Thanks for the info and the great pictures, Janice and Lee! 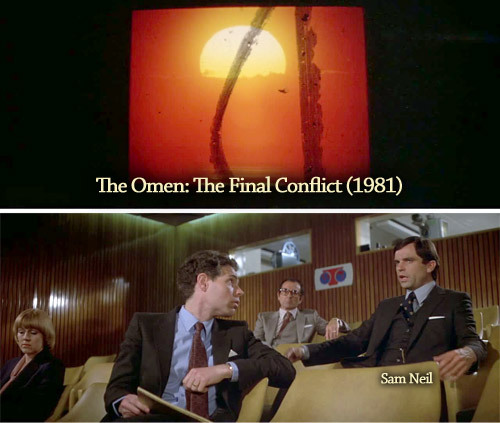 Here are captures from The Omen: The Final Conflict (1981) where Damian expresses his dislike for the proposed company promotional commercial. Hi friends, a quick timeout here to show you some discoveries from our holiday viewing! I'm guessing (seeing as the view is limited) that it's a Kodak? 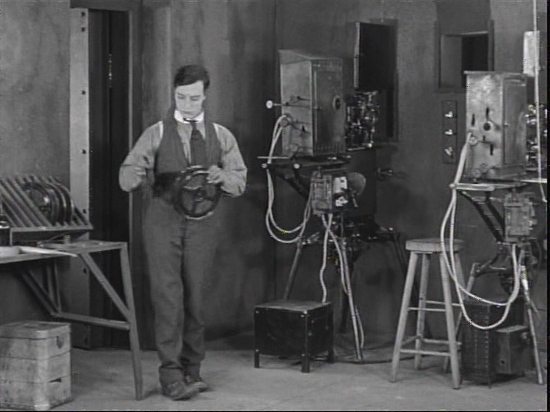 Bill...maybe it's an RCA...judging by the position of the reels. I remember that movie really frightened me as a kid. 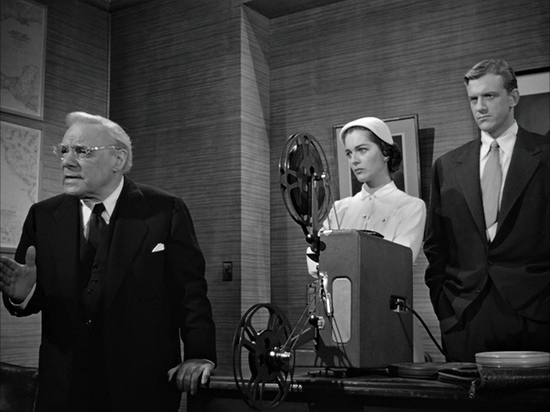 A lot of good stars...James Whitmore...James Arness...Fess Parker. 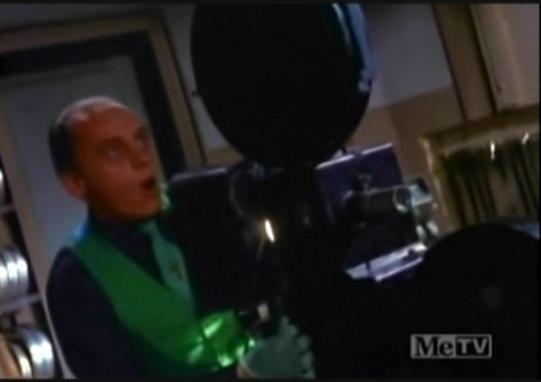 Scared my wife as a kid too, but I'd never seen it until now! ...and then walk right up the aisle and into the picture. The physical comedy that ensues is cute as he reacts to the changing scenes of a travelogue, and the special effects are pretty convincing too. But then he gets caught up in a mystery. For a long time. Like a half hour. Way longer than the reel should've lasted. We were waiting for him to get busted for letting the film run off, but we never see him load the other projector or change over! Also great fun in this movie to see some Los Angeles-area neighborhoods as they looked in 1924! That was fantastic Bill! Thanks for the synopsis of the scenes...your observations were great. 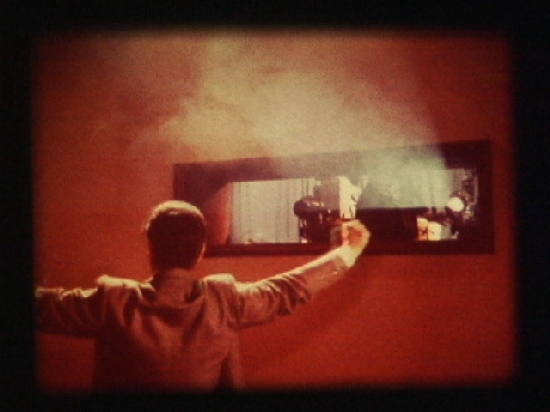 I don't usually think of special effects in old movies this old...so to see the double exposure effect was amazing. 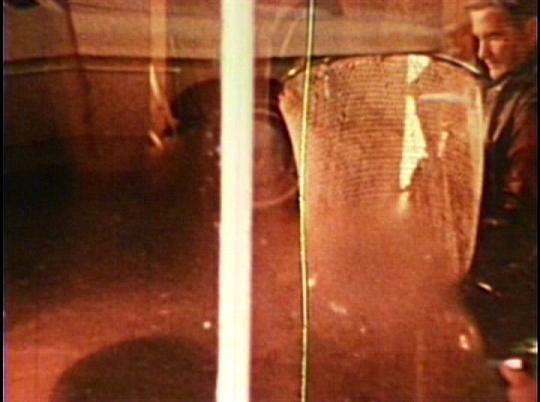 Here are some grabs from a Monty Python episode from 1970. The sketch is the famous "ministry of silly walks". I think it is a eumig P8?. It is in operation,backwards. At the end of the sketch it is thrown off the screen. I remember this action from the reruns in the 70's, being shocked by the treatment of the machine, and wanting to own a projector myself! Destruction of a good projector! There should be a law against that! Janice, the special effects in "Sherlock Jr" ranged from the conventional (and my image above fits into that category, though it was extremely well executed) to some "how did they do that" moments. 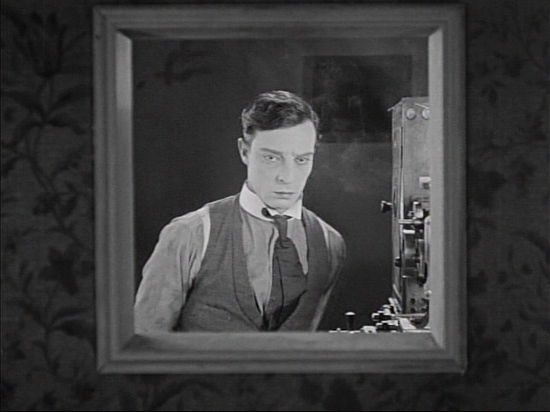 I don't have much silent movie knowledge, but of anything I've ever watched from the 20s or 30s, nothing else compares to "Sherlock" for its cleverness of technique. I'd be interested if our resident early film expert, Dino, would be willing to weigh in on this one, with his valuable knowledge? That looks like a Eumig P8. It probrbly won't break when he throws it. They were heavy and well made. All metal. They were as heavy as my 2585 16mm. Pat I can vouch for that, the little Eumig P8 went flying during the past shakes "cant remember which one" and still goes, not a mark on it. 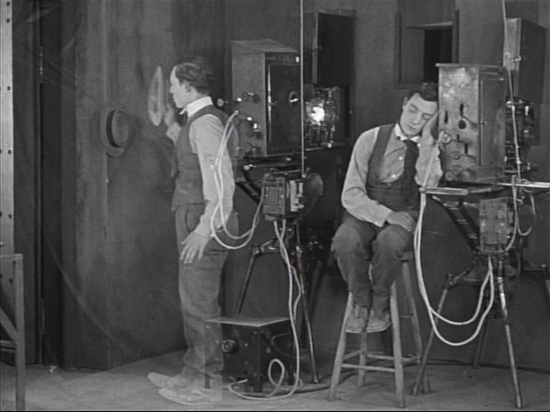 Buster Keaton sleaping in the projection box made me I remember doing the same thing and with the noise of the Air Condition unit made me dream that I was on a 747 on my way to some Pacific Island ....then I woke up ...some things dont change. The lovable Might Joe Young (1949)...was more like the Big Foot character Harry in the movie Harry and the Henderson's than the ape in King Kong... This scene at the end of the film has Joe eating a banana and then giving a playful wave back to the camera. Any guesses on the projector? 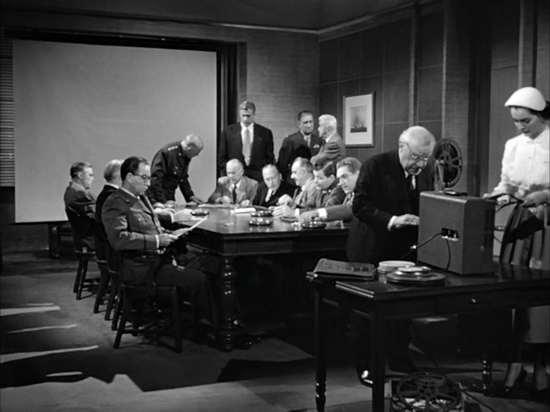 Again, looking at the position of the reels it looks like an RCA. 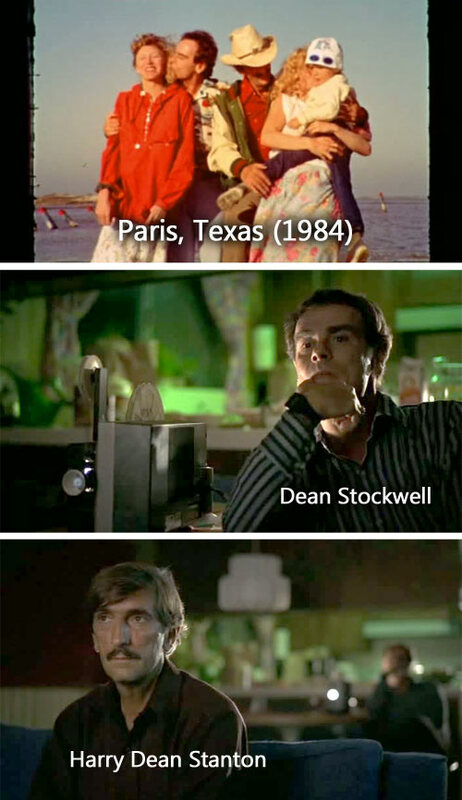 Paris, Texas (1984) is an intriquing story about Travis a man with amnesia played by Harry Dean Stanton. Travis had been missing for 4 years and then suddenly appears one day walking out from the dessert. Travis's brother Walt played by Dean Stockwell tries to find out why his brother disappeared. Walt decides that showing Travis some old home movies of Travis with his wife and young son spending a day at the beach might spark some memories. 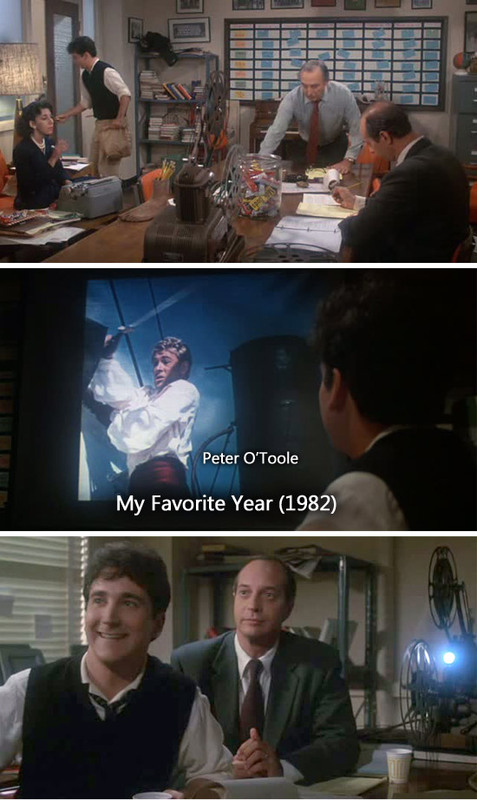 I'm not sure if this movie has been mentioned before...but Peter O'Toole was in true form as the dissolute matinee idol in My Favorite Year (1982). BTW...That projector looks more like a tank....what is it? 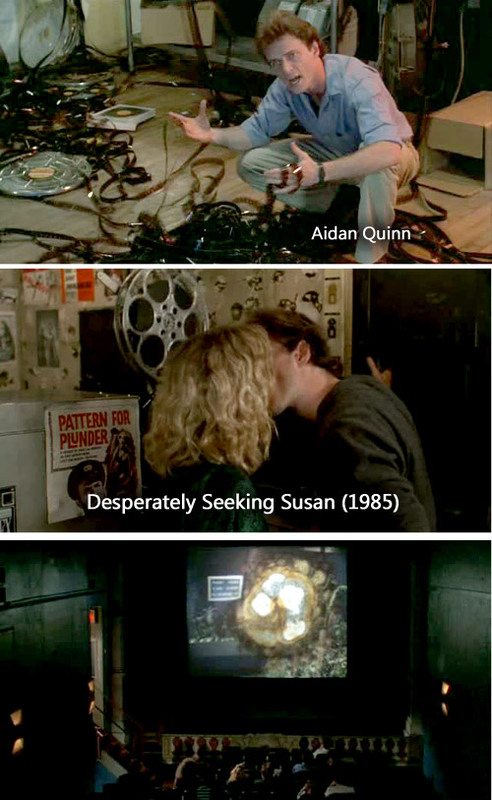 In Desperately Seeking Susan (1985) Aidan Quinn discovers his 35mm film strung out on the floor...and at the end of the movie the projector starts burning the film after Quinn kisses Rosanna Arquette in the projection booth. This movie also stars Madonna. ...also notice the small movie poster for "Pattern for Plunder". Janice, that looks like a 16mm Ampro. Used to have one but regrettably sold it during a mad clear out.